So, Celtic book their place in the last four of the Scottish Cup with victory over Hibs at Easter Road. Hope you can join us then. Enjoy your Saturday night. Cheers. Hibs coach Paul Heckingbottom: "They played well, but we didn’t quite have enough. Against Rangers on Friday we’ve got to be at our best, be on the front foot and impose our game on them. We did for a spell tonight before the first goal but we just fell short today." Quote Message: It [the bottle-throwing incident] is ridiculous. We talk about VAR on the pitch but we probably should be getting VAR in the stands to make sure we can root this out. We witness these incidents and then nothing seems to be done about it. There's got to be more emphasis on safety at football grounds. It's supposed to be a game where you can come and enjoy it. It [the bottle-throwing incident] is ridiculous. We talk about VAR on the pitch but we probably should be getting VAR in the stands to make sure we can root this out. We witness these incidents and then nothing seems to be done about it. There's got to be more emphasis on safety at football grounds. It's supposed to be a game where you can come and enjoy it. Celtic manager Neill Lennon: "The second half was outstanding, really great control. We were magnificent. Two magnificent goals but it could have been more. The control of the game was absolutely brilliant. At times we could have done a little better with the ball in the final third. "We tweaked it a little - John [Kennedy] made a few alterations at half time getting James into that no 10 position where we know he can break the lines. "Even though we were controlling the game Hibs were always in it." Quote Message: Hibs were passive through the game. The tactics were just to contain Celtic which is so unlike them. You’ve got to test Celtic's back four. You’ve got to put them to the test. The delivery from the wide areas was pathetic all night. The first half was dreary, the second half brightened up. Hibs were passive through the game. The tactics were just to contain Celtic which is so unlike them. You’ve got to test Celtic's back four. You’ve got to put them to the test. The delivery from the wide areas was pathetic all night. The first half was dreary, the second half brightened up. Celtic winger James Forrest: "A lot happened in the space of a couple of days but I think the club acting so quickly to get the new gaffer in has settled everyone. "We've had two tough games, come to two tough places and got two victories. It shows a lot of character in the dressing room." Quote Message: Hibs didn’t stamp their authority on the game. They couldn't swap from a defensive shape to an attacking shape after the first goal. Neil Lennon will be happy to have come into Edinburgh twice getting two wins. Celtic were miles ahead of Hibs today and Scott Brown showed good leadership and energy to get himself into that position to score. Hibs didn’t stamp their authority on the game. They couldn't swap from a defensive shape to an attacking shape after the first goal. Neil Lennon will be happy to have come into Edinburgh twice getting two wins. Celtic were miles ahead of Hibs today and Scott Brown showed good leadership and energy to get himself into that position to score. Celtic book their place in the last four of the Scottish Cup, courtesy of two stunning strikes by James Forrest and Scott Brown. Hibs looked dangerous on the counter but paid dearly for attacks fizzling out on the flanks. Four minutes of added time at Easter Road. Celtic winger Oliver Burke is in trouble here. The winger pulled up following a slide tackle and limps off to be replaced by Ewan Henderson. Hibernian's night in microcosm: in space on the right, skipper David Gray sends a cross straight into Kieran Tierney's midriff, much to the chagrin of the home supporters. Stevie Mallan receives a yellow card following a late challenge on Kieran Tierney to compound Hibernian's misery. A flash of Scott Brown's right boot may have put this Scottish Cup tie beyond Hibs. The hosts appear shell-shocked after that second goal. Twelve minutes plus added time remaining of a pulsating match at Easter Road. Quote Message: What a magnificent strike from Scott Brown after Odsonne Edouard managed to regain control and set up the Celtic skipper. What a magnificent strike from Scott Brown after Odsonne Edouard managed to regain control and set up the Celtic skipper. Celtic double their lead as captain Scott Brown lashes a shot high beyond Ofir Marciano after Odsonne Edouard tees up the midfielder. 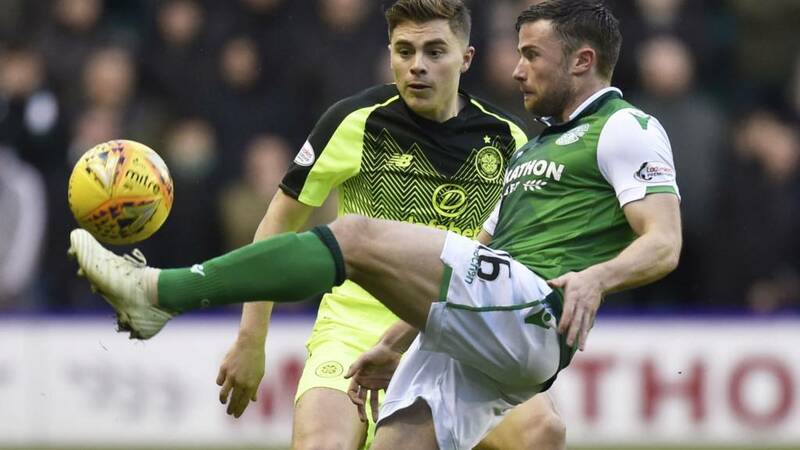 An emphatic finish from Brown; can Hibs find a way back into this Scottish Cup tie or are Celtic heading for the last four?